Excel sheets are notorious for their many formulas, references, cutting, pasting, macro’s, hidden columns and sheets and overall complexity. My story about Paul is an (very painful) example of what people can build using Excel and how organizations can become dependent on that without even knowing it, ending up in a so-called Excel Hell. Those “magic Excel sheets” or end-user generated applications contain a lot of information and a lot of business knowledge. They are a bit like spaghetti-code: it is hard to understand how exactly how they are structured and what they do. Something goes in and a result comes out, but what happens in between is in many cases a black box. The reason for this is that they are the product of a long time of development by a non-developer; in the case of Paul this sheet was a product of a career and was built by someone with absolutely no idea about coding standards or even an understanding of what benefit methods in your code could bring. The problem is however (as per the saying “people trust people, people do not trust data”) that in many cases these exact same magic sheets are used to base decisions on. And I mean not only operational, small-scale decisions but strategic, sometimes life-threatening decisions (heck, even the Nasa is believed to use magic Excel sheets to do some last minute calculations while in mid-flight). 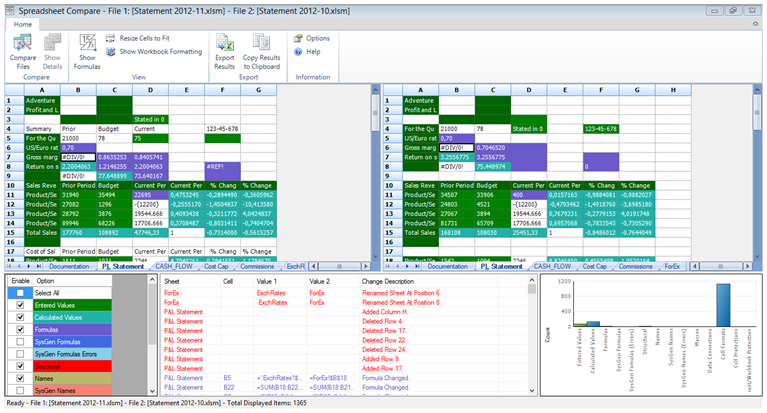 With Excel 2013 Microsoft has taken big steps in turning Excel into a trustworthy BI tool. Not only do we provide great and powerful visualization and analysis capabilities, but also we provide a way of getting data and transforming it that is both powerful and easy to use as well as completely traceable and auditable. However, it would be silly to believe that from one day to the next everyone would re-build their Excel sheets. They are just to complex to do that or to important or there is simply no time or knowledge available. In those cases the best we can do is try to understand what happened in those Excel sheets and make it visible in case anything breaks or comes out the wrong way. That’s why Inquire was introduced in Excel 2013. It is an add-in in Excel 2013 which is disabled by default. Once it is activated, an “Inquire” tab is added to the ribbon. Here we can start our research into understanding the Excel sheet. When the window opens we get a big list of information about your Excel file and what is in it. 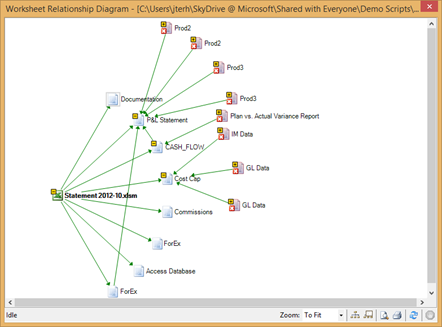 The workbook relationship function explores dependencies on other workbooks, for example through linked workbooks and data connections. 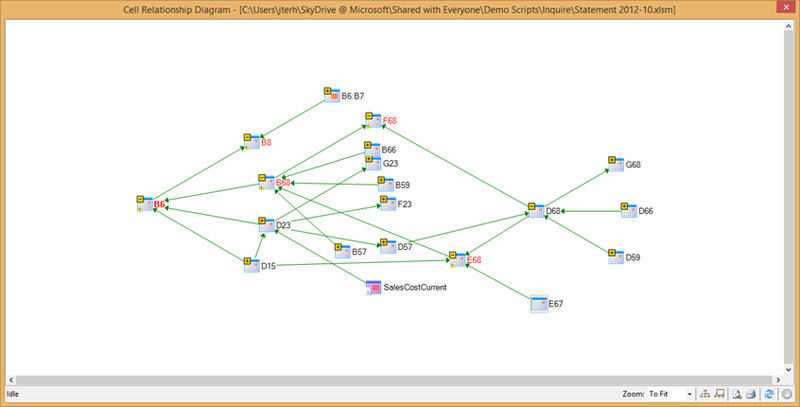 As you can see this sheet has 9 direct dependencies, 7 of which are Excel files, one HTML file and one Access database. The red indicates that the dependency is broken, i.e. the file is no longer accessible. 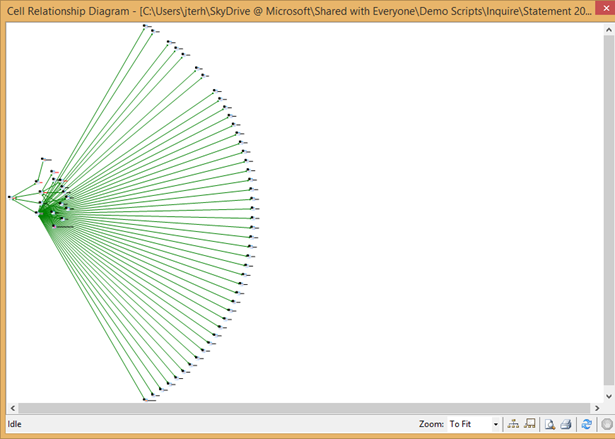 You can right click and fix the relation or dive deeper into the tree of dependencies as I did in the screenshot above. This provides a tree of how worksheets depend on each other. Sometimes you will see relationships between worksheets, which means that formulas on one worksheet reference the other. 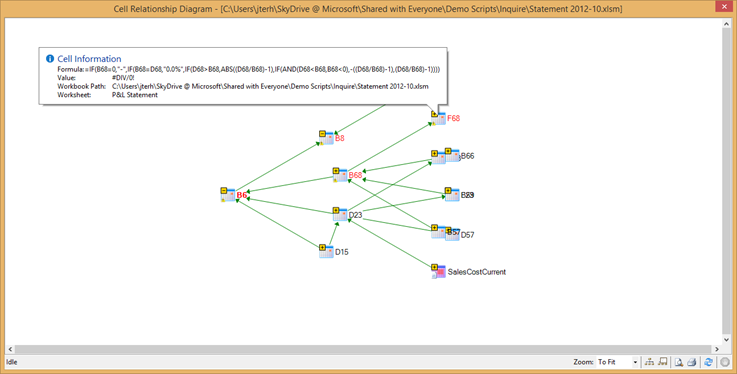 Additionally, dependencies to other worksheets are shown. Cells that are marked red have errors. If you hover over a cell in this diagram you get the formula in that cell as shown in the screenshot above. 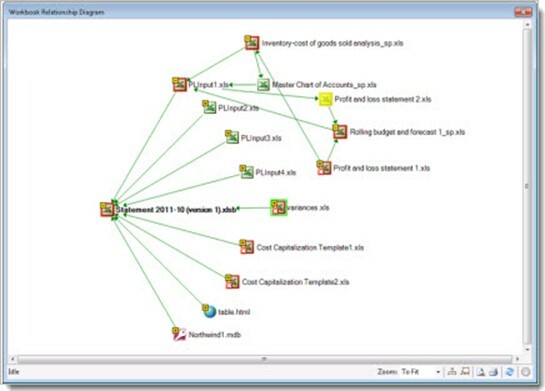 Also note that this tree shows another workbook being referenced. By clicking on the little + signs you can explore further down the tree. In this case I would like to understand why B6 is showing an error. Turns out that B6 references B68, which in turn references E68 (F68 is not referenced by B68 but rather references it, so that explains the error there). It seems like if I could figure out why E68 is erroring, I solve the B68 error and thus the error in B6 and F68. Going a little futher I suspect E67 to be the problem (it is used to divide value D68 in cell E68 but it does not return any value). Double clicking on E67 takes me to the cell in the worksheet. Immediately I see that this is an error: the cell is empty, which causes the chain of division by zero. Now the next step would be to actually change the formula definitions. Compare files is an interesting function in that it compares not only for structure or content, but also for functions, macro’s and even layout. To use it just open two Excel files and click on ‘Compare Files’. 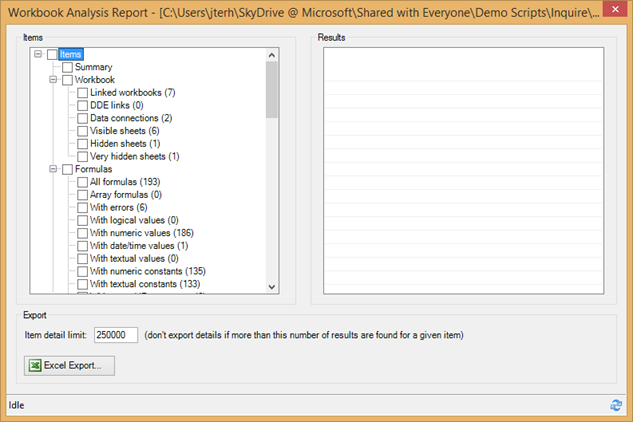 After just a while a new window opens in which you can browse the comparison results (And again export them to Excel J). We can now see that some formulas have changed and some structural changes have been made (renaming of sheets, deleting rows and columns). Additionally, one change in a macro has been made (among other things). Then for the other problem area: the macro. Selecting the macro change from the list and double clicking on the item brings up another window and here we see the exact line in the macro where the change happened. Apparently somebody changed the 10200 to 10300. This could be a serious mistake! This removes unused cell formatting information. Unused formatting information can dramatically increase the size of your workbook, so removing unused information is always a good idea. Inquire needs to store workbook passwords if you want to analyze and compare workbooks that are password protected. Using this button you can safely store the workbook passwords so Inquire can open the workbooks on your behalf. 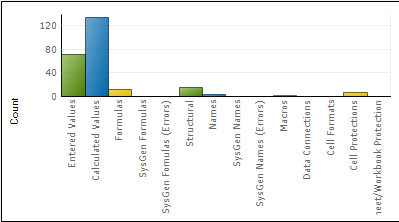 In summary: Inquire is a great tool to analyze individual Excel sheets or compare versions of Excel sheets. However, you will need to go through every single Excel sheet one by one. To implement are more automatic check of your Excel (and Access!) files the Audit and Control Management Server is available. ACM Server monitors file shares or SharePoint libraries and automatically tracks versions and changes between versions. I will introduce it and discuss how to set it up and work with it in future blog posts.